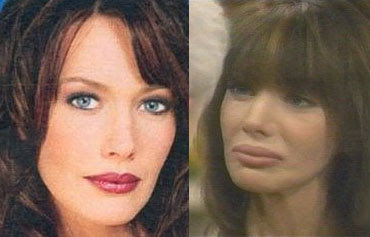 Hunter Tylo before and after breast and lip plastic surgery. If you are a fan of daytime soap operas, you will most certainly recognize Hunter Tylo as the long time sultry vixen "Taylor Forrester" on The Bold and the Beautiful. 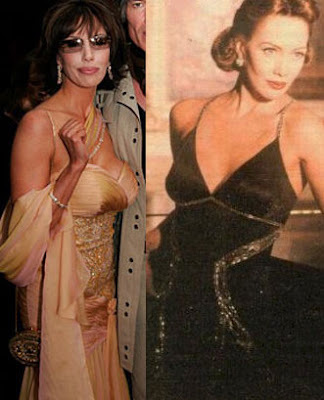 I always thought Hunter Tylo was blessed with good genes and a tremendous body and face, but apparently she thought otherwise, as we see the new and enhanced version of her in these before and after pictures. Maybe I'm just old fashion, but i think she went a little overboard on the breast implants. And the lip implants/injections were totally uncalled for, seeing how she already had absolutely sensational full lips. Whatever floats your plastic Hollywood boat, i suppose. She "was" pretty. What an idiot to ruin herself like that. Less is more! It is really sad! She was SO BEAUTIFUL, and now she has lost it! Another expressionless face due to botox.. Sorry to say...does NOT do a thing for her. I have always thought Hunter Tylo was a true beauty. I dont know what everyone is saying, but I think she looks truly beautiful. I didnt realize she had surgery as I watch the Bold & the Beautiful today. She will always be one of my favorite actress's. She was such a beautiful woman at one time. She went overboard. If she's not careful she'll end up looking like Jocelyn Wildenstein. Poor thing isn't even remotely attractive anymore. She was so amazingly beautiful, she should have aged naturally. She has totally ruined her beauty. What a shame. When will people learn to just leave them selves alone. I agree that she was a beautiful woman, now she looks like plastic. When they show reruns of her 10 yrs ago she looks as if they are taking todays pics of her except she looked great 10 yrs ago. So sad to do that to yourself. I have watched The Bold & The Beautiful since Day 1 and have always loved Hunter Tylo. I thought she was the most beautifulest woman in the whole, wide world...NOW, I can barely look at her! It makes me sick and sad :( Hunter also had beautiful long hair which, for the last several years on the show, looks like straw! It's simply heartbreaking that she did this to herself - and, there's no turning back! One disappointed fan here - to say the least! Marietta! PLEASE! OMG - Open your eyes for cryin' out loud! You can't see what Hunter Tylo did to herself!!! Do you need glasses? I watched b & b today for the first time in forever & all I could see was her lips. HIDEOUS!! She was so beautiful! What was she thinking?